WASHINGTON, DC - MARCH 06: Rep. Ilhan Omar (D-MN) participates in a House Education and Labor Committee Markup on the H.R. 582 Raise The Wage Act, in the Rayburn House Office Building on March 6, 2019 in Washington, DC. 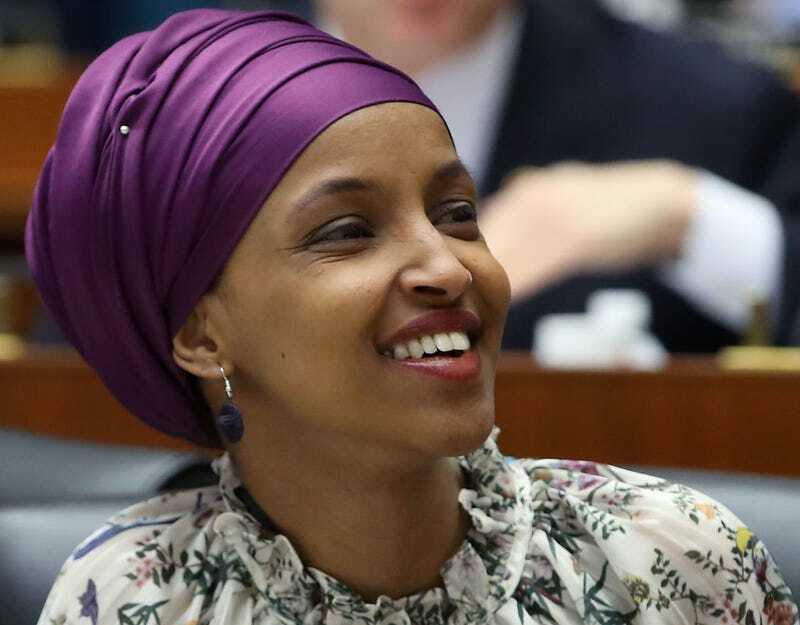 Public outcry has taken over social media as Minnesota Rep. Ilhan Omar continues to be targeted by Donald Trump and his fringe followers. As previously reported by The Root, Trump has been spitting vitriol at the Minnesota rep, mocking her just days after a man was arrested for threatening to kill her. On Friday evening, Trump took it another step further with yet another dangerous and threatening tweet. Posted at 5:35 ET, the tweet features a video that shows Rep. Ilhan Omar speaking to the Council on American-Islamic Relations (CAIR) in March 2018. Omar’s comments are followed by vivid images of the September 11, 2001 attacks on the World Trade Center and the Pentagon. Trump pinned the hate-filled tweet on his Twitter . “WE WILL NEVER FORGET!” He wrote above the graphic video. Out of respect for veterans, victims, survivors, and the PTSD-triggering effects of re-watching the attacks, the tweet won’t be re-posted in this article. Trump clearly has no such regard or respect. In addition to the hate-filled Islamophobic posts from Trump, and the death threats that have come both before and after, The New York Post also carried out its own journalistic attack against Omar. A similar violent and unnecessary image of 9/11 was smeared across their front page this week. The hate has got to stop.